James Hoggan’s Desmogblog has Inexplicable Problems with Ross Gelbspan. Why? Weird. Ross Gelbspan founded the global warming anti-skeptic web site Desmogblog, he said so directly just eight seconds into this audio interview. 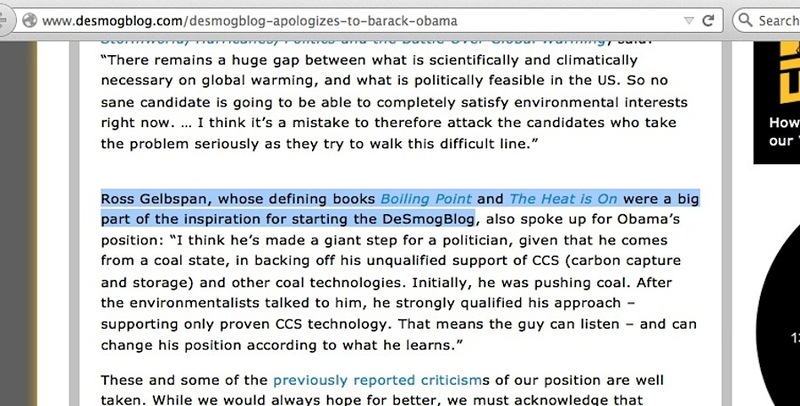 James Hoggan credits Gelbspan as “a big part of the inspiration for starting the DeSmogBlog” (4th paragraph here). Gelbspan was a frequent blogger there, 50 pages’ worth of 10 pieces per page, from January 2006 to November 2010. So, from that level of familiarity, why would Hoggan go flying off a cliff over a central detail about Gelbspan? Not a word mentioning what prompted Gelbspan to look into skeptics’ work in the first place. Worse, from Gelbspan’s various narratives, we could only guess he talked to scientists he didn’t know, who advised him that skeptic scientists put out questionable science assessments and had unknown funding sources. But here, Hoggan says this was a friend naming a specific skeptic scientist, suggesting more directly that Dr Singer’s funding was suspect. This doesn’t bolster Gelbspan’s narratives, it only begs for more questions. In another interview account (10th paragraph here), Gelbspan “learned that some of the climate skeptics would be testifying—and be compelled under oath to reveal their funding sources—in St. Paul, Minnesota“, an event taking place a mere eight weeks after Gelbspan co-wrote the WashPo article with Paul Epstein. The semantics question to ask is whether the word “learned” means he was fed information about an obscure Public Utilities hearing from someone else, or if the word should have been “discovered”, as in finding out this information via investigative reporter skills. But the larger question concerns who would have known in advance that a hearing about global warming science assessments was going to compel skeptic scientists to disclose what their funding was under oath…. was it the “friend” Hoggan spoke of, hence the hint about Dr Singer’s funding? A far more effective method of discrediting such skeptics would be to irrefutably show how their science conclusions were false. After that point, questions of funding become relevant only if it could demonstrated that their conclusions were scripted in the boardrooms of the fossil fuel industry, and not resulting from the skeptic scientists’ sheer incompetence with understanding climate science. Somebody appears to have been putting the cart before the horse in this situation. And too many details about it aren’t lining up right. This entry was posted in Desmogblog, Irreconcilable differences, James Hoggan, Narrative derailment, Three degrees of Separation or Less and tagged Minnesota Public Utilities Commission hearings, Paul R. Epstein, S. Fred Singer by Russell Cook. Bookmark the permalink.